Support Team Dairy: mixing politics and dairy promotion...in a fun way! 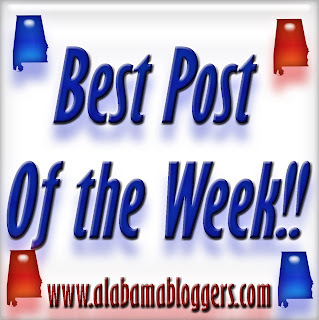 We love Alabama Bloggers! Thanks for hosting this! 3. Birmingham Blogging Academy - Why writers could rule the blogosphere. 4. Project Bulk - Failure is a matter of perspective. Well, I am just out of control. Yes, I started a new blog. New as in a new domain but old as in blogger and topic. I hope you visit often. I promise, THIS is THE ONE! Thanks for giving us a place to share our stories! Sharing my healthy fruit purchases in lieu of sugary treats....but who can resist just a few chocolates in honor of Halloween? I also have posted pictures of all my pets, including a SPOOKY one. I posted in an older link up! sorry about that. My post is an update on my hansel and gretel house! thanks for doing this! www.preservingyourmemories.wordpress.com is a blog about digital scrap booking. Make it your own connects to my Heritage Makers blog. Please join in the world of digital scrap booking!! !